After several readers inquired about leaving headroom when bottling, I felt obligated to experiment. I had always learned to fill the kombucha all the way to the top when bottling for a secondary fermentation. This stops the activity of the bacteria because of the exclusion of oxygen, while the yeast can continue to ferment the sugars to create CO2 and an effervescent drink, because yeasts can function with or without oxygen (1). After being prompted to do some experimenting on my own, I left around an inch of headroom in several kombucha bottles for a secondary fermentation. I left the bottles out for a few days, and then I refrigerated them. I didn't open the bottles right away because I already had some kombucha bottles open, but I pulled one out from the refrigerator a week or so later and found that the kombucha bottled with around an inch of headroom was more fizzy than a good number of my previous batches! Although Happy Herbalist mentions to fill the kombucha to the top of the bottles in their Brewing Guide (look under "Bottling"), on their Bottling Tips page there is a section "Choosing to leave an airspace." According to their Bottling Tips page, if you leave oxygen and airspace in the bottle and if the temperatures are between 70-85 degrees F, the bacteria will continue to remain active and the kombucha will continue to sour, which makes sense because the bacteria require oxygen. Meanwhile, the yeasts can function with or without oxygen. However, according to Happy Herbalist, yeasts only form carbon dioxide and fizz when oxygen is present (2). "Carbon dioxide suffocates/diminishes the bacteria, but produce[s] the fizz and sparkling brew. Without oxygen the yeast produce more alcohol...The yeast may be active in temperatures as low as 40F (5C) with or without oxygen" (2). In other words, if you leave headspace when bottling, the yeasts can create more carbon dioxide and fizz because of the oxygen present in the airspace. But if there is no airspace, the ability of the yeasts to produce an effervescent drink is limited because of the limited availability of oxygen. Thus, I am somewhat still confused about the exact relationship between the yeasts, oxygen, carbon dioxide, and kombucha fizz. Perhaps the presence of oxygen helps to encourage the yeasts to form more carbon dioxide and fizz, but its presence is not necessary? Something to note is that kombucha that is bottled all the way to the top will taste different than kombucha that is bottled with airspace, such as in the amount of fizz produced and in others ways as well, such as the acidity of the drink. I have not found much information on the recomended amount of airspace if you decide to bottle kombucha this way. However, beer brewers tend to leave 1-2 inches of headspace in their bottles according to this thread. Again, experimentation is key, and do whatever you prefer according to personal preference and taste! As always, I am continuing to learn more about kombucha day by day, and I hope to share that information. If you have any more information or tips on the bottling process and kombucha fizz, please send the information my way or leave a comment! All my posts related to bottling can be found here. 3. Frank, Gunther W. Kombucha - Healthy beverage and natural remedy from the Far East. 4th ed. Austria: Wilhelm Ennsthaler, 1994. Confirmation that headroom helps prevent the bottle from exploding from the buildup of carbon dioxide. You can still increase the fizz in your brew whether or not you leave headroom in your bottle. You won't lose fizz by leaving headspace in the bottle. You lose more fizz the more you transfer the kombucha from container to container. You can actually decarbonate your brew by transferring your kombucha from container to container. In this article from Happy Herbalist, it states that aerobic and anaerobic yeasts in kombucha help to produce carbonation, and that the production of more carbonation than alcohol by both types of yeast is favored when oxygen is present, which is in line with the other Happy Herbalist information (that I am conflicted about) that I provided above. Part of the reason why there doesn't seem to be a clear answer to the question about whether it is better or not to leave headroom to create more fizz, is because kombucha ferments and SCOBYs contain different strains of bacteria and yeasts and in different proportions. Wild and airborne bacteria and yeasts, which differ according to the location and environment, add even more variation to the mix. Here is one Analysis of a Kombucha Ferment by Happy Herbalist as an example for what may be in your brew. I personally prefer to bottle with headroom at the moment. But it is up to you, and based on your experiences, to decide whether or not you want to leave headroom in your bottles. I recommend experimenting with both. If anyone wants to share their experiences with bottling, please do so! A little feedback on headroom when bottling. I am new to the world of kombucha (still fermenting my third batch) but I have been brewing beer for a while now. When I bottled my last two batches, I left one inch of headroom (the same way I do when bottling beer) fearing the bottles could explode (unlikely) and to preserve the seals on my bottles (I use 32oz reusable grolsch style bottles). My batches came out great, effervescent and contamination free. Despite this, I was still curious about what the difference between bottling with or without headroom could mean for my brew. For information about the secondary fermentation process (dominated by the yeasts) I first turned to BeerAdvocate.com's yeast guide (below). From that page it is easy to see how yeast type (a wild card with your SCOBY) and temperature can change the flavor of your brew quite a bit. Next, I blew the dust off my undergraduate biochemistry textbook, and actually cracked it open to get some information on fermentation. Yeasts consume sugar in order to make ATP (the main biological energy compound) NOT so we can have carbonated beverages. 8-) In the presence of oxygen, yeasts perform oxidative phosphorylation which is a very efficient process for making ATP from sugar. This also makes the byproducts: water and CO2 among others. When there is no oxygen present however, yeast requires another mechanism for survival - fermentation. In this case, the sugar is broken down through glycolysis into pyruvic acid; which is further broken down into ethanol and CO2 during anaerobic ATP synthesis. This process is less efficient for the yeast, but it leads to the same effervescent result for the brewer (plus some alcohol). My take-home from this, is whether you bottle with headroom or without, you will get a carbonated brew. However, the taste can vary greatly depending on many factors such as the activity level of the bacteria/yeast, what yeast strains are present and the temperature at which you ferment. I hope this explanation wasn't too dry. ;-) Cheers! Thanks again for the thorough explanation and feedback Michael! It's very helpful. Thank for your in depth explanations. I've got my bottled kombucha filled all the way to the top. I just don't want my very first brew to explode in my face. I suppose like you, i'll experiment and see what type of bottling produces the best fizz and is less likely to burst. Thanks for your efforts. Thanks, and thank you for visiting my blog! Experimenting sounds like a good way to go, and, in any case, everyone always ends up with his or her own style of brewing. :) Good luck! Thanks for the great blog! It has taught me much :) I've been brewing for a few months now and have one problem that I just can't seem to solve; whenever I put my bottled KT in the fridge, it always looses it's fizz. I know it has a bunch before I refrigerate it (as I always open one bottle in the batch prior to refrigeration and they always overflow). But after even 1 day in the fridge, flat. I'm using G.T. Dave bottles and leave about 1/2 inch headroom. Just curious if anyone else has experienced this? And again, thanks for all the info you put out there! Thanks Blane, and thanks for the comment! 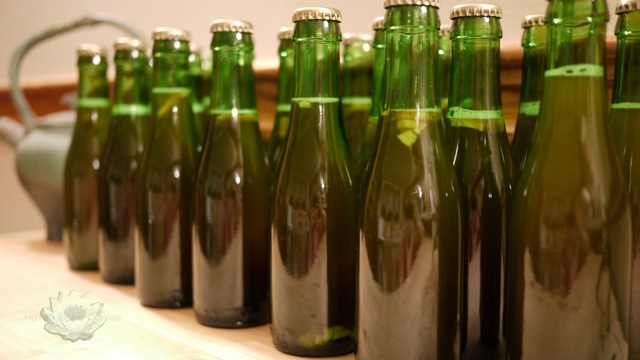 Have you ever considered bottling in beer bottles? I typically bottle my kombucha in beer bottles, and I purchased extra bottle caps and a bottle capper from the Modern Homebrew Emporium in Davis Sq. in Somerville, MA. I haven't had a problem keeping my kombucha fizzy when I bottle in beer bottles because it creates a tight seal, but when I use other bottles, such as G.T. Dave's with reusable caps, I tend to lose more fizz because the seal isn't as tight. I write about some bottling options here. http://www.kombuchafuel.com/2009/02/kombucha-bottling-101.html. Hope this helps and thanks again! In Alana Pascal's book, she informs that when Kombucha is capped, and anaerobic fermentation occurs, toxic by product is created namely in the form of acetone (think paint thinner or nail polish remover). Acetone is a ketone that is very destructive to the kidneys. She indicates that Kombucha should not be stored capped in the refrigerator for more than an astonishingly conservative 3 days or there is the risk acetone production. According to some of the info I've read, it seems that it's possible that if acetone is present in kombucha in small enough amounts, that it may not be considered harmful. To avoid potential problems with acetone, one could brew kombucha and not bottle it. This could be done by brewing using the continuous brewing method. Another option would be to brew using the traditional brewing method such as in a gallon jar. When the brew is ready, store it (with the SCOBY inside as well) in the fridge, and every time you want to drink kombucha, take the container out of the fridge and pour out some kombucha off the top (opening the jar every few days will thus introduce more oxygen into the brew). When the level of kombucha in the container gets low, take it out of the fridge, allow it to warm up to room temperature overnight, and you can start brewing again the next day. I do not have a refrigeration. I was wondering if I bottle my KT if it will continue to sour and be no good, or should I bring it to a friends house to make it dormant in the frige?? If you bottle the kombucha, I would bring it to a friend's house to make it dormant in the fridge. If you don't refrigerate it, the brew will continue fermenting in the bottle, possibly causing CO2 to build up inside and making the bottle explode. You may consider brewing smaller batches, so every time the kombucha is done, you can drink most of it immediately or within the next few days (just pour the kombucha out of the fermentation vessel), so you won't need to bother with refrigeration. I know this is way late, but I just stumbled into homebrewing kt. I am growing my first SCOBY as we speak(only 2 days in). I am a high school AP Biology teacher, so I thought I would throw my two cents into this. When yeast go through cellular respiration, they are trying to make ATP (adenosine triphosphate) as someone already mentioned. When oxygen is present, yeast can fully oxidize a molecule of glucose into 6 molecules of CO2. Glucose has 6 carbons (C6H12O6) and each CO2 has one carbon. When oxygen is not present, yeast go through fermentation (alcohol fermentation, unlike us who go through lactic acid fermentation when O2 is not available for our cells. This causes the soreness in muscles when we work out.) The alcohol is ethanol (CH3CH2OH)which contains 2 carbons. Each molecule of glucose gets broken down to 2 molecules of ethanol and 2 molecules of CO2. So, with oxygen yeast break down each molecule of glucose into 6 CO2, and without oxygen yeast break down each molecule of glucose into 2 molecules of CO2. The fizz will be produced either way, although it will occur quicker with the presence of oxygen. Thank you Mike for sharing a thorough and informative response! I hope your SCOBY is growing well and happy brewing!